Gardens and the love of flowers formed key elements of Islamic art and imperial culture. The tulip became inseparable from Ottoman gardens and garden design. Tea is British, cafés are French and tulips are Dutch. These Western cultural assumptions are understandable for the many people unaware of the history of tea, cafés and tulips. Europeans adopted the last two from the Ottomans. If the introduction of coffee houses into Europe was subject to social criticism in certain quarters, tulips immediately cast their luscious spell over the Europeans as they had over the Turks centuries earlier. Botanist Carolus Clusius brought the tulip to Europe in the second half of the 16th century and, along with them, the aura of mystique that surrounded both the flower and Ottoman culture. The tulip that is now deeply woven into the fabric of Dutch national identity symbolized wealth, nobility and beauty and influenced garden design and the fine arts. It also led to financial excesses in the Netherlands. During tulipomania (1633-37), a period of the Dutch Golden Age, tulips were so prized and expensive, that a single bulb ran between $40,000 and $80,000and sufficed to buy an elegant home in the best district of Amsterdam. The fever, passion and emotion that tulips have aroused in both Europe and the Middle East raises the question of whether they might possess intrinsic properties that render them so spellbinding. The tulip is native to Central Asia, the original homeland of the Turks, explaining why it is inextricably bound up with their history. If the flower from the lilac family is so firmly associated with the Ottoman period, it already played a role during the earlier Seljuks of Rum dynasty (1077-1308). 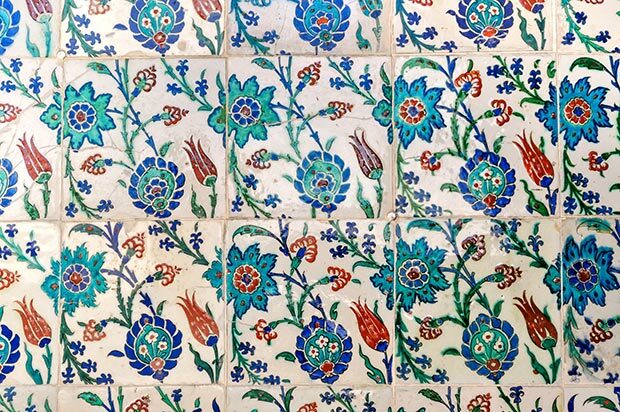 Tulip motifs are found, for example, on the beautiful polychrome tiles that once adorned Sultan Alaeddin Keykubad’s 13th century palace overlooking the turquoise waters of Lake Beyşehir. The flower appears in Rumi’s poetry of the same period. That Persian poets like Omar Khayyam and Hafiz also cite the tulip demonstrates that the flower’s appeal in the Middle East stretched beyond the Turkic world. There is no doubt, however, that the tulip came into its own symbolically and horticulturally during the Ottoman period where it occupies a place of choice in every imperial garden and artistic medium. The beautiful bloom decorates Iznik ceramics, the brocaded robes of Sultan Suleiman, Levni miniatures and Ottoman-period illumination, carpets and embroidery. As a symbol, the tulip is rich and multi-faceted. In addition to signifying feminine beauty, perfection, paradise, the Turkish native homeland and collective cultural identity, the tulip also possessed a spiritual dimension. It was thought to protect from evil as demonstrated by Ottoman talismans or Sultan Murad’s son’s battle shirt buried along with him. Now housed in Istanbul’s Museum of Turkish and Decorative Arts, Beyazid’s garment displays Qur’anic verses on its front and embroidered tulips on its back. To best understand the prevalence of the tulip motif in religious settings such as those found on the decorative ceramic tiling of Sinan’s Rustem Pasha Mosque in Istanbul, one must, however, turn to the Turkish (originally Persian) word for tulip, lale that possesses orthographic and onomatopoeic similarities to the word Allah. Moreover, in the abjad system or Islamic numerology lale carries the same value as Allah. As such, the tulip constitutes an object of spiritual meditation. Mystics also liked to state that the flower is humble because, when in bloom, it bows its head before the majesty of God. Gardens and the love of flowers formed key elements of Islamic art and imperial culture. The tulip became inseparable from Ottoman gardens and garden design. Sultan Selim II (r. 1566-74) ordered, for example, 50,000 bulbs of wild tulips for his palace gardens. The flower began to be cultivated and thousands of varieties were produced. The poetic Persian names that were given to them during the reign of Mehmed IV (r. 1648-66) further underscore the Ottomans love of tulips, such as ‘Light of Paradise’, ‘Matchless Pearl’, ‘Cloth of Love’, ‘Rose of the Dawn’ or ‘Fountain of Life’. The form of the perfect tulip in Ottoman culture differs, however, from European taste; the tulips that were considered the most beautiful were those that were long and thin and carried dagger-shaped sharp petals, a type often encountered in the Ottoman decorative and book arts. Tulips also reached exorbitant prices in Ottoman territories, like the ‘Pomegranate Lance’ that sold for $600 in the early 18th century. However, an imperial decree was issued to control speculation and fix prices for the most rare varieties, thereby preventing the tulip-based boom and crash the Netherlands witnessed. Akin to ‘tulipomania’ in the Netherlands, the flower lent its name to characterize a historical period. The ‘Tulip Era’, (1718-30), a time of great artistic ferment, effectively owes its name to the Ottoman trend and obsession for tulips in courtly circles. The Ottoman taste for tulips waned during the second half of the 18th century, but never disappeared as Istanbul’s contemporary tulip festivals demonstrate. The tulip’s taut, elegant form and its brilliant colour range help elucidate the poetry and mysticism that the flower evoked, as did its unpredictability. The flower confounded cultivators. Bulbs that produced single colour blooms one year would appear as multicoloured the following year or the seeds of a single flower planted in the identical conditions would give rise to different types of blooms. The tulip obviously possesses an inscrutable life of its own and, perhaps for this reason, it remains on par with the eternal rose even while bearing no heavenly scent. 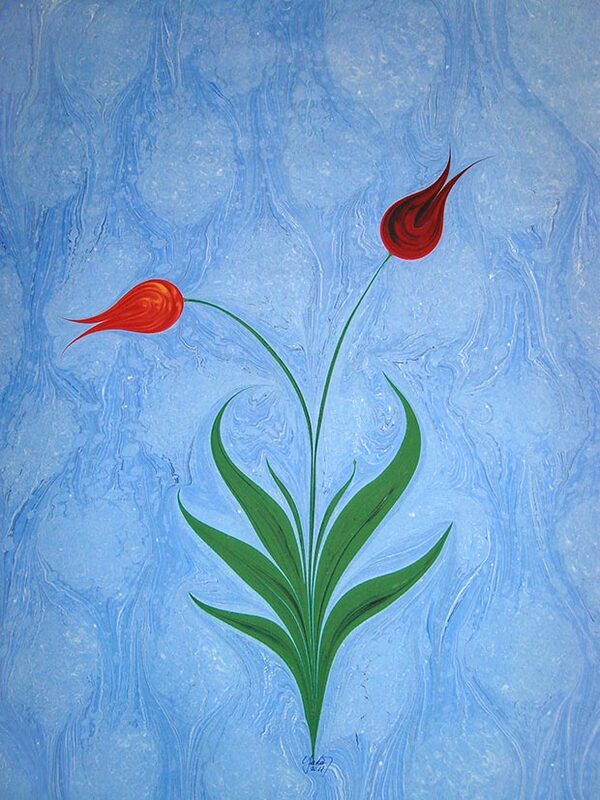 The tulip continues to flourish in Turkish and Turkish-influenced visual culture. 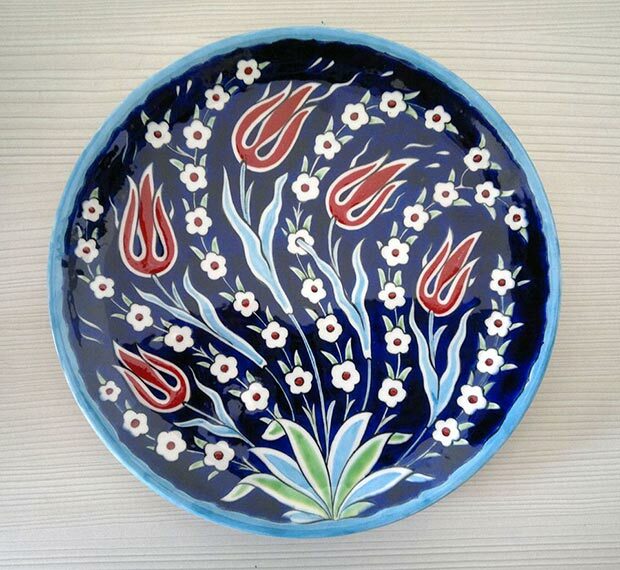 In Turkish traditional art departments across the country, its sleek silhouette still features in the ceramics, ebru and tezhip fashioned by both students and professors. It also constitutes a powerful tool of contemporary branding in the tourism, financial and cultural industries. The history of the beloved bloom has happily not ended. The mystery and charm of the ‘King of the Bulbs’ with its ardent colour and sculptural form are obviously here to stay.